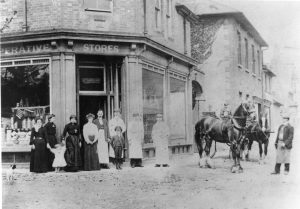 The Co-operative Store, Town Street (now High Street) with Manager and Staff, 1900. Earl Manvers, together with Mrs. Alexander of Edwinstowe Hall and the Rev. H.T. Hayman proposed the setting up of a co-operative in the village. The premises were obtained following the death of Mr. Richard W. Marston, the postmaster and grocer. A committee was formed. Mr. William Curtis, schoolmaster was the secretary and the Committee consisted of the vicar, the Rev. 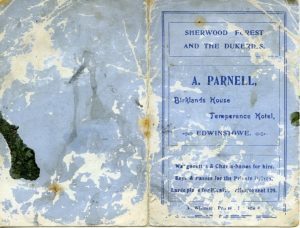 H. T. Hayman, Mr. R. W. Wordsworth, Earl Manvers agent, two other members nominated by Earl Manvers, four working men from Edwinstowe, one from Budby and one from Perlethorpe. Stock for the enterprise was purchased at a cost of a little over £205. Rent for the premises was 15 shillings (75p) for six months. Licences for the sale of beer, tobacco and patent medicines were obtained at a cost of £5. 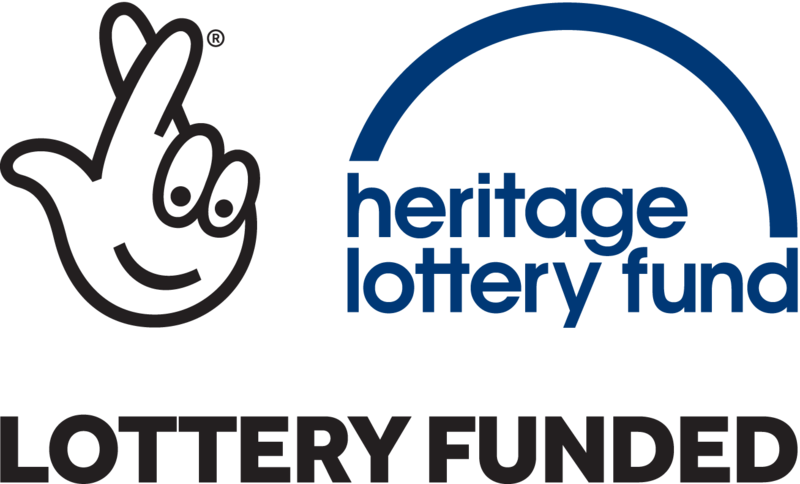 A loan of £250 was made by Earl Manvers. 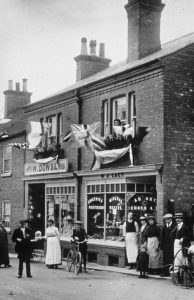 The shop opened on 1st April,1895. The Nottingham and District Trades’ Directory1902-03 lists A. Parnell as Manager. A quarterly dividend was paid to members based on their purchases. Non-members received a half dividend. The store prospered and was extended over time to accommodate a bakery, a butchers and a drapery department. 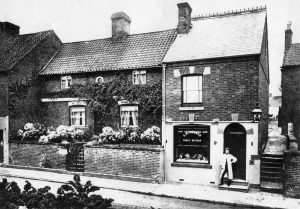 A serious fire occurred in February 1907, causing an estimated £1200 of damage and was reported in the Retford and Gainsborough Times. The fire was brought under control by the local Fire Brigade under the command of Captain Morley whose home and the Fire Station were across the road. 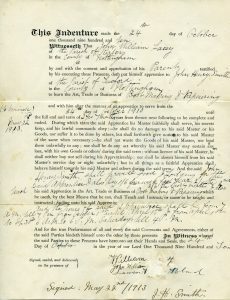 Owing to a drop-in membership of the Society, it was decided to join with the Mansfield Co-operative Society as Branch No.26. 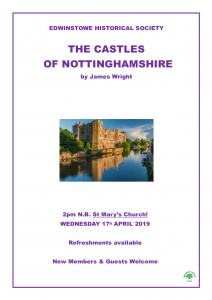 Eventually, it became part of the Greater Nottingham Society. 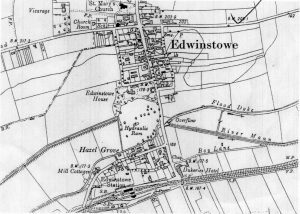 In 1801, the population of Edwinstowe was 506. The village was in two distinct parts. The larger part being on raised ground to the north of the water meadows and the base of most commercial activity. To the south of the River Maun the smaller part, known as Hazel Grove, was near to mills on what is now Mill Lane. In this vicinity, were a fulling mill and a water mill. There were several windmills, one of which was situated on Mansfield Road. After the Enclosure Acts, large fields were subdivided into smaller field by hedges and fences; thus the landscape began to have the appearance familiar in the present day. 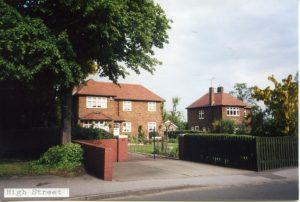 The community of Edwinstowe was virtually self-sufficient. In 1832 there were, living and working: 2 blacksmiths, 1 bricklayer, 3 butchers, 15 farmers, 2 grocers and drapers, 3 joiners, 1 maltster, 1 miller and baker, 1 nurseryman, 1 sawyer, 9 shoe-makers, 1 stonemason, 3 tailors, 1 weaver, and 3 wheelwrights. 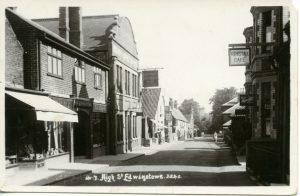 Edwinstowe also had a doctor, a schoolmaster, and 4 innkeepers. The Census of 1891 records a population of 933. The following businesses were listed: 5 blacksmiths, 3 bricklayers with 2 apprentices, 2 butchers,12 farmers, 5 grocers and 1 draper,7 joiners, 4 bakers, 2 cordwainers ( master shoe makers), 2 shoemakers, 1 tailor, 5 wheelwrights with 2 apprentices,1 cab proprietor, 1 waggoner and 3 carters, 2 coal dealers, also 1 tobacconist, 1 watchmaker, 2 artists 2 rat catchers and a rabbit catcher. On Rufford Road, then known as Lydgett, was a Gas Maker and a Fireworks Factory with 5 working Pyrotechnists. 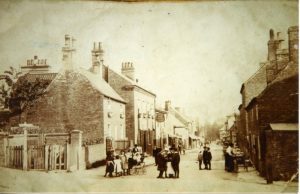 1906 looking south from the junction with Ollerton Road, Mansfield Road and Church Street. 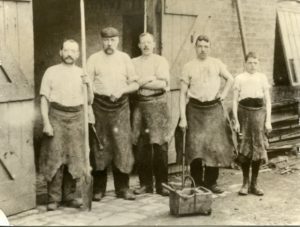 The Morley family worked as blacksmiths at premises on Ollerton Road. 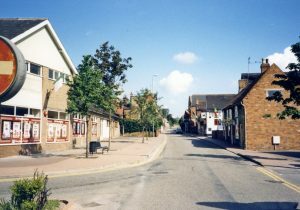 High Street, looking (south) toward (railway) station. 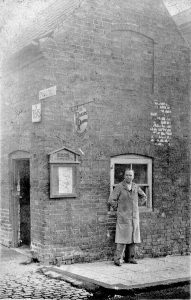 The first door on the left was M & W Turners’ shop. 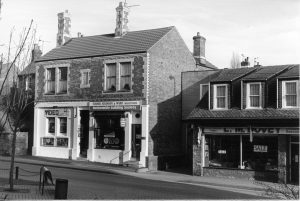 Although small it was fish and chip shop, Greengrocers, Newsagents, Sweetshop, etc. Next shop down was Freemans butchers. The man walking past the telegraph pole is passing the village pound, where stray animals were impound. W. J. Lacy was a confectioner. 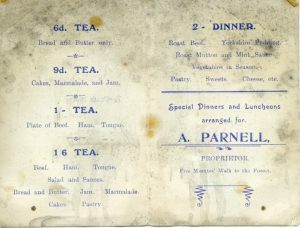 The business also had dining and tea rooms. The Nottingham and District Trades’ Directory lists Henry Symonds as Postmaster and Hackney Carriage Owner in 1885. 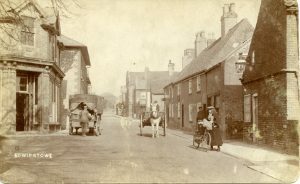 Village Post Office about 1900. Note the sign ’Horses and Carriages for Hire’. This is now the site of the new Library and Health Centre. 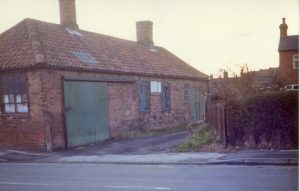 The site of Edwinstowe’s first Post Office. 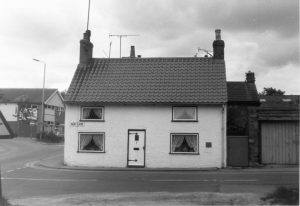 These attractive cottages, numbers 24 to 34, High Street, Edwinstowe, were the site of Edwinstowe’s first Post Office. This picture was taken 18th August 1964. 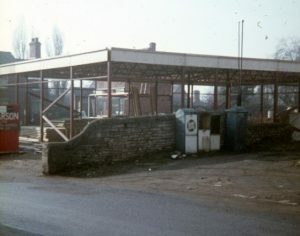 The houses were demolished on 21st April 1967 to make way for the new Library. My maternal grandparents, Fred and Alice Lowe lived at 24 High Street adjacent to the garage yard for many years. Fred had worked as a plate layer for the railway. They had two daughters, ‘Tid’, my aunt and in 1917, Ena, my mum. 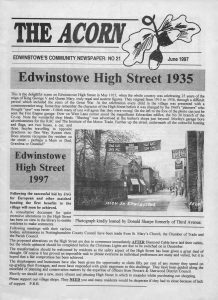 My mother attended the school in the High Street, and after leaving school, had worked as an usherette at the (now gone) cinema on Mansfield Road. During the war, she met my father Owen Roberts who was a trooper with the Household Cavalry stationed at Rufford. They married in St Mary’s church, Edwinstowe on the 1st January 1940-41. My mum and dad, then moved south to Farnham (where my dad came from) in Surrey where they had 3 sons, Roy in 1942 David (me) in 1945 and Keith in 1946. I have fond memories of our visits to see my grandparents in the 1950’s. We would come up on 2 motorbike and sidecar outfits. One was my dad’s and the other his mate Charlie Cole. They would park in the ‘garage yard’ next door. 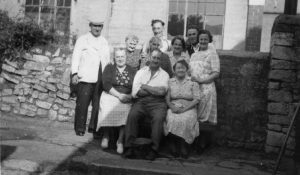 My grandparent’s neighbours were Mr. and Mrs. George Whitworth Mr. and Mrs. Harvey and Phyllis, Charlie and Paul Tyndall in the end cottage. On our visits, the neighbours would help with housing us all, and I think my mum and dad stayed in a house somewhere near where the pet shop now is. I recall the name Woodhouse who I believe may have been a school friend of my mums. I remember going to a shop somewhere further down the street on the same side as the cottages to get a bottle of stout for my gran on occasions (how times change). We boys would go to the fish and chip shop (where I think the butchers now stand) to get a ‘four penny mix’ for tea. I recall a sweet shop opposite number 24 and slightly up the street. We would play in a much quieter forest and even in the Major Oak before the supports were installed, I have vivid memories of that every time we visit now. I think some of the forest roads near the green may have had base Tarmac or similar then too. Back to the cottages. – At the back of the cottages was an alley and hard up against the garden bank were brick ‘sheds’. Which house the toilet (I think) and storage including the tin baths and maybe the hot water boiling tubs. There was only a cold tap in kitchen in most cottages then. Between the ‘sheds’ were steps leading to the veg gardens beyond and in my grandad’s garden he had a large summer house style shed which had a barber’s chair. Men would come for a haircut and sit on benches admiring the veg growing and sharing advice whilst waiting their turn. 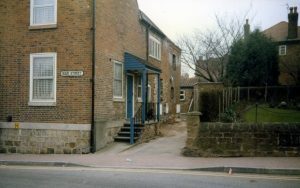 I remember sitting on the wall between the garage yard and the cottages back alley. Early in the mornings, we would wake to the sound of the miner’s boots as they marched to Thoresby pit. We would wash in a bowl with a big jug for the water back then. I can remember also turning the handle of the clothes mangle for my gran. We visited Thoresby pit once and went to the winding house where Phil Tyndall worked. My dad went in the cage with others down the mine. I can remember the air pressure difference in the winding house. I also remember going to the fire station but I think it has moved further down the road now. My grandad must have been a retained fireman because I can remember wearing a gold fire helmet which was placed on my head. My grandad had an allotment where he spent a lot of time. There were always others there and there seemed to be a lot of chatting going on. I thought the allotments were closer to where the bungalows now stand opposite forest corner. Charlie and Phil Tyndall were keen cricketers and I believe Charlie was a green keeper for the club and maybe an umpire. After my mum and dad passed on, my dad in 2000, and mum in 2007 we had the opportunity to bring mum home and her ashes were scattered in the church yard. Since then, we’ve come every Easter and put flowers on the grave of Charles Lowe. We’re not sure how he’s related to my grandad but they both originated from Clipstone. 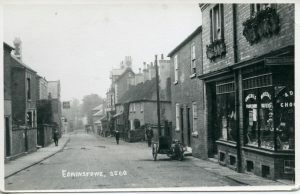 We very much love Edwinstowe and my Daughter Karin has always been interested in seeking any information on her beloved Gran and family as well as myself. Some residents of the cottages. I hope this information is of interest to you and I’m sure I will remember more in time. Many residents were surprised and concerned to see a For Sale board go up outside the Adult Education Centre on High Street. This building has been used by the community since it was built in 1913. Margaret Woodhead, informs Acorn, that the building was called The Institute and John Howitt & Son were the Architects for this building and the Church Rooms. Both were built by Earl Manvers. The building comprised a billiard room, a reading room and a lounge; it was built with the intention of keeping the young men of the village out of the public houses of which, with a population of about 900, there were four. Joe Bennett and Cecil Whitworth remember playing billiards in the back room. Joe also remembers that there were framed photographs on the walls of all the men who were killed in the First World War. During both wars, it was used by the local troops and the W.M.C.A. 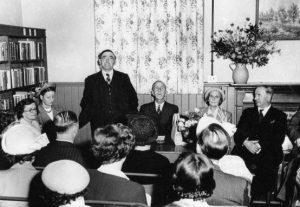 In the early 1940’s, it was used for the first baby clinic in the village; the clinic was then transferred to the Church Rooms so that the building could be used as a library. 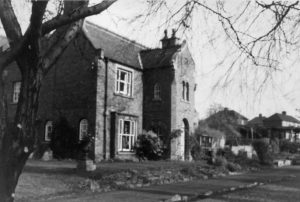 It was rented, for a number of years from Earl Manvers for £15 per annum. 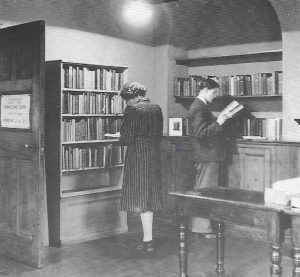 In 1947, a library occupied one room in the Village Social Centre. It opened 4 hours a week on Wednesday afternoons. It was then purchased by Notts. 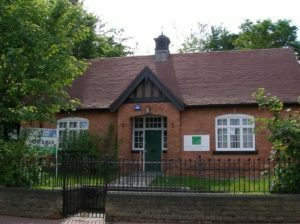 County Council for £1,250 and converted into a branch library. It was officially opened on 12 July 1951 by Fred Kitchen a local author of novels. 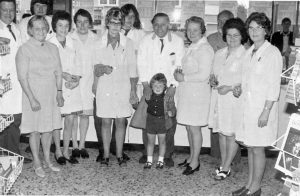 Many groups and organisations have met there including the Parish Council, a Yoga class, C.A.B., Drop-in-Centre for the Elderly, and, for a short time, it was used as a consulting room for a local optician. 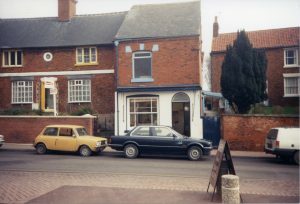 In 1992, the building was taken over by Newark & Sherwood College, (Not to be confused with Newark & Sherwood District Council) to be used as an Adult Education Centre. This year Newark & Sherwood College merged with Lincoln College who wish to sell the building as it is now surplus to requirement. Acorn has contacted the Principle of Lincoln College to inform him of the disappointment felt by many residents that a building that was built for, and has always been used for the community is to be sold on the open market with the proceeds being earmarked for Newark. John Fabin, Chairman, informs Acorn that the Parish Council were eager to see that the building was retained for community use, but at a recent meeting, the members agreed that they could not raise over £200,000 needed to purchase the building. He said that the building also needed refurbishing and bringing up-to-date with disabled access and toilets, and the Council was not prepared to put the village into debt. Members agreed it was grossly unfair that a building that was built for community use would now be sold to the highest bidder. Birklands House built by Alexander Parnell and under family ownership 1857 – 1931. 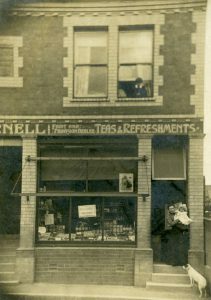 It was a temperance hotel, meaning that no alcohol was served. At the date of writing (July 2017), the Video – remember them? 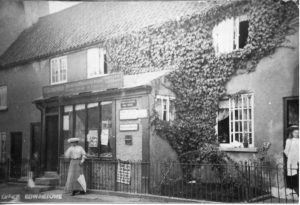 – shop is now a children’s clothes shop; the premises on the is a solicitor’s office; the building standing back is a crafting shop and the shop of M. Dovey at no. 25 is now Dudley Taylor Pharmacy. 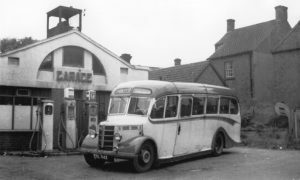 Joe Bennett writes: The corrugated iron building between the Jug and Glass and the Black Swan was a sweet shop. 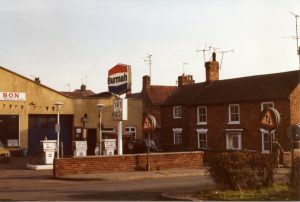 The new shop left of the Jug and Glass was built on an old garage and farmyard about 1933. 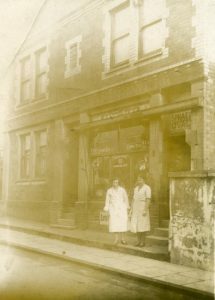 The shop with the awning up was Jam Tart Moody’s Grocers. The garage was owned by Mr. Bryan. 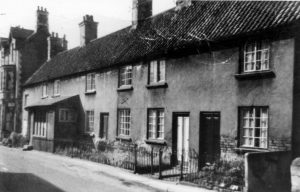 The cottage opposite the Jug and Glass housed the village constable and was where the village jail was sited. Evidence of this can still be seen; there are two rings in the wall beside the driveway.